It's time for more Lunch Posts! George and I met at Samurai Sam's for the first time in, well, a long time. Even though my last lunch posting was over two years ago, we have continued to have lunch at least every two or three weeks on average. Enough about that... on to the agenda! It happened... 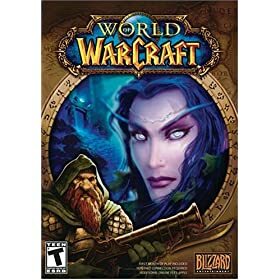 I finally bought World of Warcraft. I've played on a few 10-day free trials, and decided to dive in with a permanent account. It is (as I was warned) addictive, time-consuming, and doesn't ever really end... you just keep running around, bashing stuff, finding stuff, cashing in your stuff, and buying more stuff. Still, I really enjoy it. The places you can visit in the "world" are interesting, and the involvement of other actual players makes it pretty fun. I've joined a guild, something that brings many benefits. I've invited George to join, and we are going to try to play together soon. I saw a story last week about a company that is making Zeppelins (it seems they have been for a decade). No, these won't meet a fiery end as the Hindenburg did-- the Zeppelin NT uses helium for lift. The story I read talked about a company called Airship Ventures that is buying one to use in the San Francisco area (the first flight will be on Halloween). "The pen is mightier than the sword if the sword is very short, and the pen is very sharp." His latest boating adventure caused me to bring up is old J24 sailboat, and ask him if he missed it. While he thinks about it now and then, the cost of keeping it in a slip at Lake Pleasant just made it impossible to keep. I remarked that he could always sell his house and live on the boat! Of course, a J24 doesn't have much room. George mentioned that one of his favorite John D. MacDonald characters, Travis McGee, lived on a boat in Florida. McGee kept his fictional Busted Flush at slip F-18, Bahia Mar, in Ft. Lauderdamndale, Florida (McGee's pet name for the city). While the guy and the boat are fictional, the slip actually exists. A plaque commemorating McGee was erected on the spot. Randy Wayne White, another author whom George and I have discussed, was at the ceremony dedicating the plaque. His own character, Doc Ford, is sort of considered the be the modern-day McGee. I'm currently pretending to read a Doc Ford novel, Twelve Mile Limit. George recently read Jon Krakauer's book Into The Wild, and saw the movie, too. The book is an unusual biography, since you learn almost as much about Krakauer's efforts to tracked down what happened to Christopher McCandless as you do about McCandless' story itself. McCandless graduated from college, sold nearly all his belongings, gave his trust fund to charity, and set off an a two-year journey of discovery and adventure. Unfortunately, he never told any of his friends or family that he was going or where he was going... and since the story ends with his death in the Alaskan wilderness, it is fitting that we also learn how Krakauer uncovered the facts of McCandless' journeys. I read the book myself several years ago, and then saw the Sean Penn film last year. Penn took a different approach and just told Christopher's story, following him on his travels. Hal Holbrook was nominated for Best Supporting Actor (I'm ashamed to admit I thought he was dead...). I felt the movie completely and accurately captured the tone of the book. I highly recommend both of them. 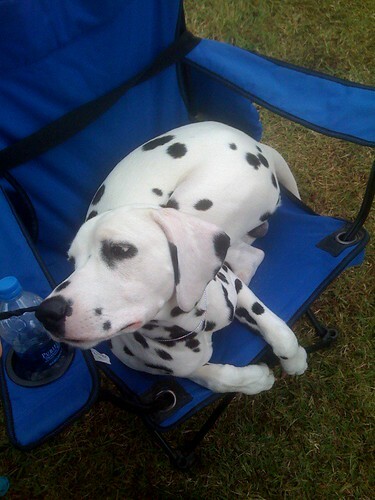 My wife Teri is in California this weekend, taking Charlie to his first big dog show. Three days, two people, two dogs, one small motel room... sounds like fun. She's been taking him to handling classes (she does most of the learning), so she hopes he is ready. He'll be in a puppy classification, so hopefully the competition isn't too stiff. I'll add a photo from the show as soon as she returns. Teri was looking for a better knot (to attach a line to Charlie's lead clasp). She hunted the internet, and found this terrific site with animated videos of knot-tying, where she learned to tie the buntline hitch. Very cool for the aspiring sailor. I'm not sure how I missed it, but 32 million people saw this YouTube video of a pride of lions receiving a little payback from some buffaloes. Check out the cameo of a crocodile, too! Okay, we've never actually had a book club on Lunch with George, but we've read and discussed a lot of 'em. 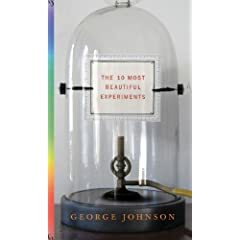 I haven't read it yet, but I think this one might be interesting: The Ten Most Beautiful Experiments by George Johnson. He takes a look at some of the great, ground-breaking experiments that provided illumination on scientific truths without the benefit of elaborate, expensive equipment. I have a copy on order, and I'll provide my book report when I get the chance. If the video isn't appearing here, just go to YouTube. I've really enjoyed reading every issue of Astonishing X-men (most area available in graphic novel form), written by Joss Whedon. I'm sad to say that the final issue will hit the newstands within a few weeks, and then Joss is moving on to something new. I was poking around the web to find out what Whedon is doing, and discovered that he is releasing a new limited series just for Firefly fans: Serenity: Better Days. Published by Dark Horse Comics, the three issues follow our favorite ship and crew in the days when they were all still together. Read about Serenity: Better Days #1 here, and pre-order all three at TFAW. Take a look at this Battlestar Galactica Last Supper. ZenHabits (creator of the Zen to Done productivity system) has posted quick reviews of five different applications for Mac OS users who want to implement David Allen's Getting Things Done method on their computer. He also Added his own home-grown method at the end of the article. See 5 Amazing Mac Apps for Getting Things Done. Cool image of the Earth and Moon as seen from the HiRISE instrument aboard the Mars Reconnaissance Explorer in orbit around Mars. You can see a better version of the photo and read the whole story here. This reminds me of the somewhat famous image taken by the Voyager I spacecraft as it was headed outward in the 70s. At the Planetary Society I found a gallery of photos of the Earth taken only from Spacecraft. Check it out!